KPU's first speaker, former John F. Kennedy presidential aide Theodore C. Sorenson, speaks to a packed house on September 16, 1968. 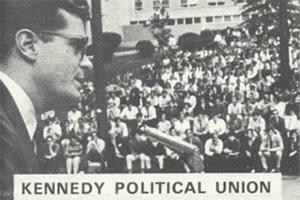 Fifty years ago this week, Kennedy Political Union (KPU) celebrated its formation with a speech by former John F. Kennedy presidential aide Theodore C. Sorenson. On September 16, 1968, nearly five years after JFK gave his famous “Strategy of Peace” commencement address at AU, Sorenson received three standing ovations and paved the way for decades of remarks by politicians and prominent speakers hosted by KPU. KPU’s first season of speakers comprised 25 journalists, politicians, and activists, including William F. Buckley and Roy Cohn, who served as Senator Joseph McCarthy’s chief counsel. In the decades since, the organization has welcomed hundreds of speakers, such as those featured in the photos below. Today KPU continues its student-run mission of creating a forum for civic engagement. "When I look back at all the amazing accomplishments of my predecessors over the last 50 years, I remember that there is no limit to the opportunities and speakers KPU can bring to the AU community. It helps drive my vision for KPU," said current director Yazan Hanouneh. On Monday, KPU announced this year’s All-American Weekend speaker: Former United States Attorney General Loretta Lynch. Learn more from KPU’s Facebook page. "In addition to our staple All-American Weekend and WONK of the Year guests, this year students can expect speakers who embody and are fighting for the issues our generation cares about," Hanouneh said. "I'm really excited for this year's lineup."